I recently added a new touch to the noodles. A lot of customers, especially ladies don't like shallots and most thought that I would be usually lots of raw shallots and chives in the noodles. In fact, the sauce has nothing raw. The shallots are slowly cooked in oil for at least 45 minutes and when the nice flavours and aromas are infused in the oils, we add the seasonings. Soy sauce along with a bit of dark soy sauce and pepper are then added and blended together. 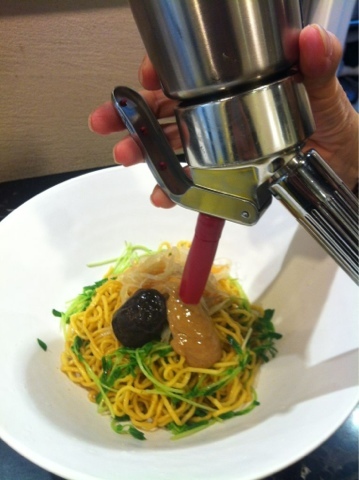 To top off, the sauce is transformed into a foam and a little is added on the noodles in front of the customers.